Series: Who is the Jesus? We often used to sing ‘Jesus be the centre’, a lovely song with sincere lyrics: ‘Jesus, be the centre, be my source, be my light, Jesus.’ The problem is though, that the words may reflect our perception but they do not reflect reality. Jesus cannot be the centre because we wish Him to be – He IS the centre. Many may choose to deny this, or be ignorant of this truth, but this does not change reality. When Jesus Christ rose from the dead and ascended into heaven He continued to live in transformed bodily form. 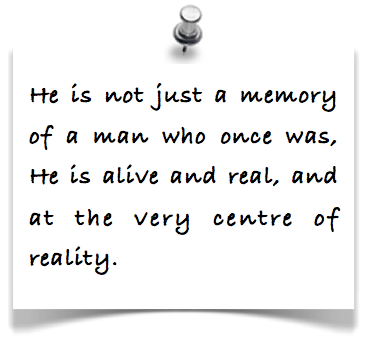 He is not just a memory of a man who once was, He is alive and real, and at the very centre of reality. This is why John the revelator described Jesus, the Lamb of God, standing in the centre of the throne. This why the book of Acts records how ‘Stephen , full of the Holy Spirit, looked up to heaven and saw the glory of God, and Jesus standing at the right hand of God. 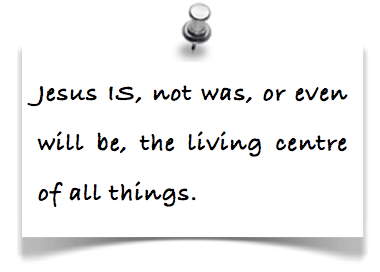 “Look,” he said, “I see heaven open and the Son of Man standing at the right hand of God.”’ (Acts 7:55-56) This is why we must understand that Jesus IS, not was, or even will be, the living centre of all things. So the centrality of Jesus, Christocentricity, is not just a concept, it is a term that describes a relationship with the living lord. To be Jesus-centred is therefore more than singing or theologising about Him, it is about relating to Him as the central person in our lives and in our churches. The Bible is our inspired reference to who Jesus is and what He is like, but the Jesus it speaks of is not pressed between its pages like a rare but dry flower from the past. Nor is the Jesus the Bible describes a religious icon or a historical artefact. Jesus is alive! He is as described in the scriptures but He is not a literary character, He is a living being. Religion honours a historical Jesus and studies His teachings in order to determine laws for living. Relationship seeks to know Jesus, to learn about Him from the ‘then’ of scripture so that He might be real to us in the ‘now’ of living. To acknowledge that Jesus is both alive and central to life is to talk to Him, minister with Him, make joint decisions together with Him, and to experience daily life with Him. But here is the problem – how do we make the transition from an intellectual knowledge of the historical Jesus, to a real relationship with the living Lord? I am going to explore this question in the Blog posts that follow but in the meanwhile I would really value your insights – what do you think are the key components to making this transition from religion to relationship? Realising how I, and how we, need Presence more than answers has been a key component for myself. We tend to think that the Bible is just there to give us answers to life’s questions, but moreso it’s there to help us enter into His Presence, but showing us who He is. It also seems that often God doesn’t give answers at all (such as in difficult times, when we lose a loved one etc.) and in these times I think we don’t even want answers – what we need is His Presence more than anything. “but moreso it’s there to help us enter into His Presence, but showing us who He is. ” – typo, should be ‘BY’ showing us who He is.